Surface piercings are body modifications that go through a flat piece of skin. Common locations for surface piercings are the eyebrow, the nape of the neck, the tops of the wrists and what is referred to as a corset piercing, in which rings go down the back in order to be laced up with ribbon. Surface piercings are prone to rejection, or growing out through the skin. 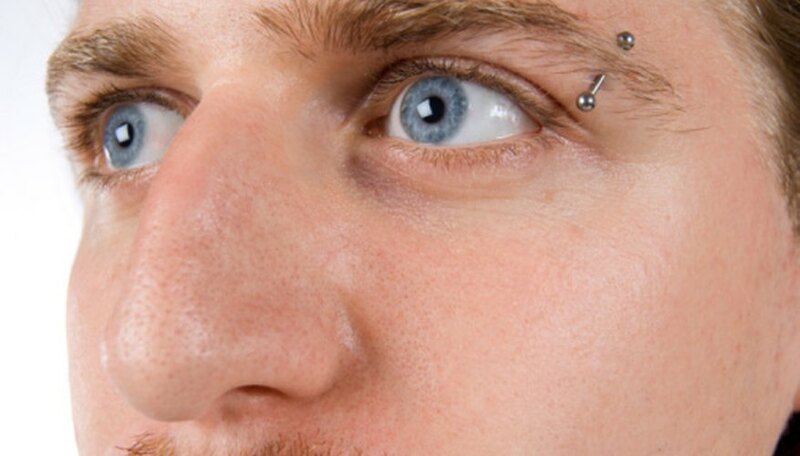 One commonly used material for these piercings is Tygon, a flexible plastic surgical tubing. Wash your hands and your piercing with antibacterial or antimicrobial soap. Use a clean paper towel to dry them. Unscrew the bead from one end of your surface barbell or Tygon tubing. Gently pull on the other bead to remove the jewelry. Massage the skin around your piercing for one or two minutes, to make jewelry insertion more comfortable and accessible. Pinch up the skin in between the two holes, to bring them closer together. Unscrew one bead from your new jewelry. Guide the Tygon tubing or surface bar into the first hole and push gently until it emerges from the exit hole. Push against the attached bead to make the tubing or bar stick out as much as possible from the exit hole. Screw the loose bead into the open end of the tubing or surface bar. If you are using a metal bar, twist both beads in opposite directions to tighten them. You will find your surface piercing much easier to change if you have a friend to help you. Better yet, visit a professional piercer who can ensure sterile technique and appropriate jewelry. Never attempt to change a surface piercing that is not completely healed. If you are unsure whether your piercing is ready to be changed, or if you experience any discomfort or difficulty when attempting to remove your jewelry, consult a piercer certified by the Association of Professional Piercers.